Continuing my sequence from Sounding the Seasons, the collection of my sonnets for the church year, published by Canterbury Press, the 29th September brings us the feast of St. Michael and All Angels which is known as Michaelmas in England, and this first autumn term in many schools and universities is still called the Michaelmas term. The Archangel Michael is traditionally thought of as the Captain of the Heavenly Host, and, following an image from the book of Revelation, is often shown standing on a dragon, an image of Satan subdued and bound by the strength of Heaven. 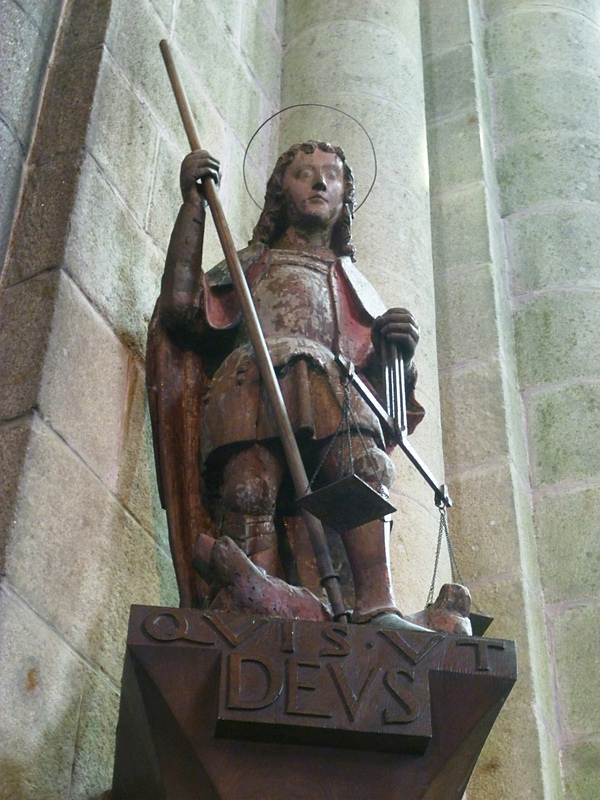 He is also shown with a drawn sword, or a spear and a pair of scales or balances, for he represents, truth, discernment, the light and energy of intellect, to cut through tangles and confusion, to set us free to discern and choose. He is celebrated and revered in all three Monotheistic religions. There is a good, full account of him here. And here is a bright and playful image of him by the Cambridge Artist Rebecca Merry, who has done a number of icons and other images of the Archangels. You can see more of her art here, and also in the Byard Art Gallery. And here is a response to the poem from photographer Margot Krebs Neale, weaving the words at the heart of the poem into the heart-shaped image. More of Margot’s work can be seen here. As always you can hear the poem by clicking on the ‘play’ button if it appears, or the title. Many of you have commented on how good it is to be able to hear the poems, and I’m glad thats working. And Michael’s scale is true, his blade is bright. To flourish in the touch and reach of light. 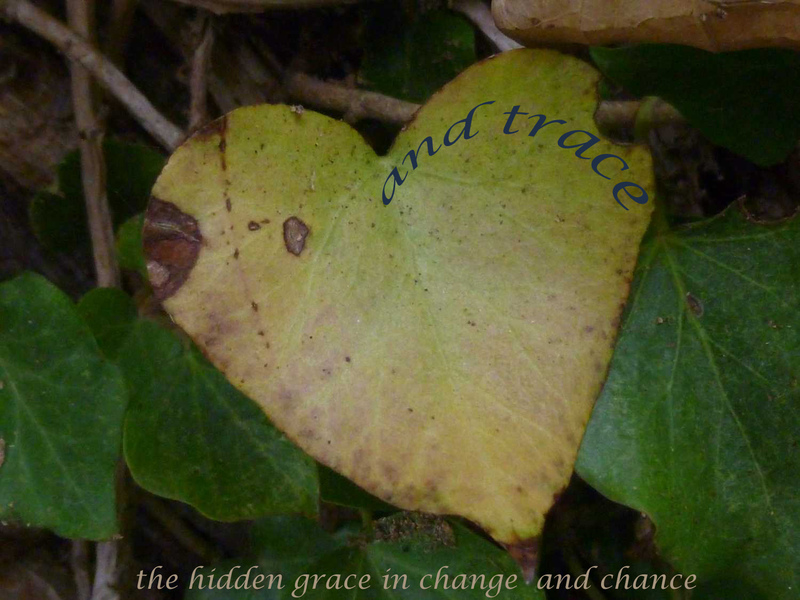 And trace the hidden grace in change and chance. And pierce the clotted darkness in my heart. And overthrow the tyrannies of Hell. This poem also appears as the epigraph in the new edition of Holly Ordway’s excellent book ‘Not God’s Type’ which I highly recommend. As always you can hear the poem by clicking on the ‘play’ button if it appears, or the title. Many of you have commented on how good it is to be able to hear the poems, and I’m glad thats working. Continuing my sequence from Sounding the Seasons, the collection of my sonnets for the church year, published by Canterbury Press, we come, this Sunday, to the feast of St. Michael and All Angels which is known as Michaelmas in England, and this first autumn term in many schools and universities is still called the Michaelmas term. The Archangel Michael is traditionally thought of as the Captain of the Heavenly Host, and following an image from the book of Revelation, is often shown standing on a dragon, an image of Satan subdued and bound by the strength of Heaven. He is also shown with a drawn sword, or a spear and a pair of scales or balances, for he represents, truth, discernment, the light and energy of intellect, to cut through tangles and confusion, to set us free to discern and choose. He is celebrated and revered in all three Monotheistic religions. There is a good, full account of him here. And here is a bright and playful image of him by the Cambridge Artist Rebecca Merry, who has done a number of icons and other images of the Archangels. You can see more of her art here, and also in the Byard Art Gallery. Continuing my sequence from Sounding the Seasons, the collection of my sonnets for the church year which will be published this December by Canterbury Press, we come to the feast of St. Michael and All Angels which is known as Michaelmas in England, and this first autumn term in many schools and universities is still called the Michaelmas term. 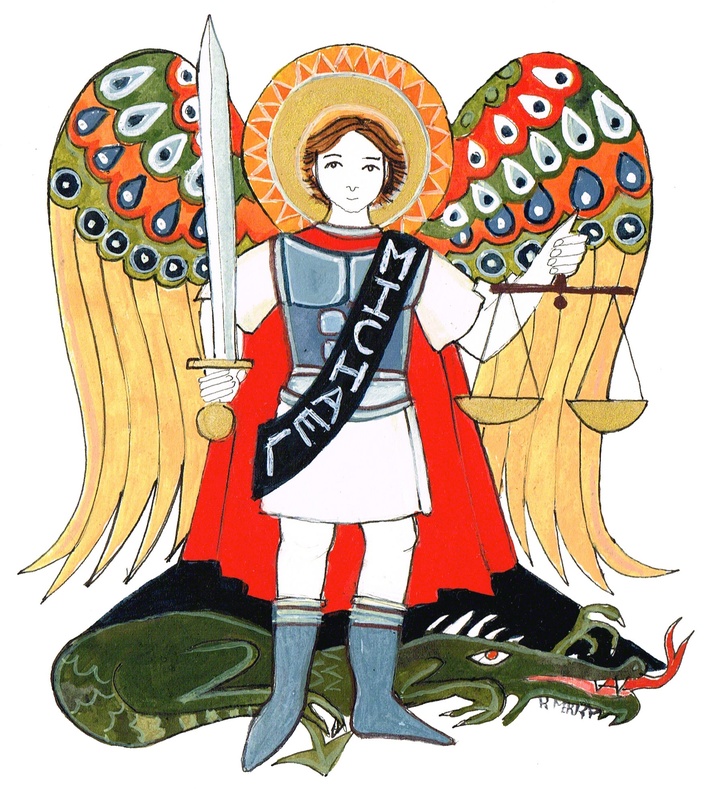 The Archangel Michael is traditionally thought of as the Captain of the Heavenly Host, and following an image from the book of Revelation, is often shown standing on a dragon, an image of Satan subdued and bound by the strength of Heaven. He is also shown with a drawn sword, or a spear and a pair of scales or balances, for he represents, truth, discernment, the light and energy of intellect, to cut through tangles and confusion, to set us free to discern and choose. He is celebrated and revered in all three Monotheistic religions. There is a good, full account of him here. And here is a bright and playful image of him by the Cambridge Artist Rebecca Merry, who has done a number of icons and other images of the Archangels. You can see more of her art here, and also in the Byard Art Gallery.